I think I might be in love. And that love is the ever faithful one for a beautiful log cabin quilt. 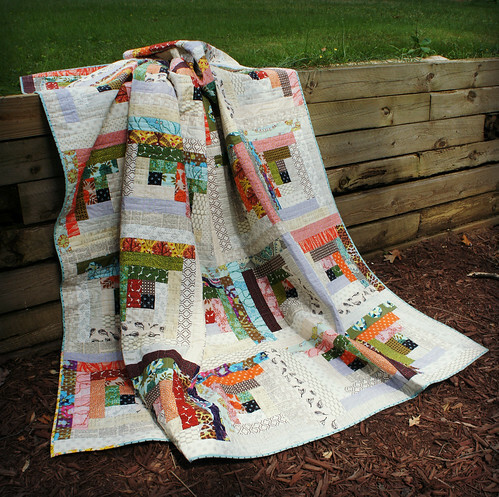 There is just something about a log cabin quilt that always makes my heart happy. I think we all have a pattern that we are constantly drawn back to, and for me, that pattern is the log cabin. Begun on a whim and finished with passion, this quilt has squirreled its way into my heart one piece of fabric at a time. If you were following along, you know that I began this with a F8 bundle of Juliana Horner’s first line (daughter of Anna Maria Horner) available at Joanns. I felt uncertain about this line and in my uncertainty, I turned to a pattern that I knew would toss these fabrics together in a way that I would find pleasing. The intense colors of her line begged me to calm them with an assortment of neutral/low volume fabrics with a warm tone to them. This quilt pushed me. I don’t necessarily love every fabric in it. But I worked with the idea of saturated color and creamy low volumes to create a cohesive pattern. Once again, brown has managed to creep into the quilt giving this whole design a warmth that charcoal greys would not have given. It took me a bit of time to decide on the layout of the blocks and I really love what I ended with. These pyramids of color are rising from the neutral fabrics and everything is evenly dispersed. Again, not where I thought I was going with this quilt, but the right end to it. In making the blocks, I never repeated a single fabric in any block except the main center square. I think that small element is what ultimately ties each of the blocks together. One single 2.5″ square of black/blue fabric at the center of each block anchors them all. 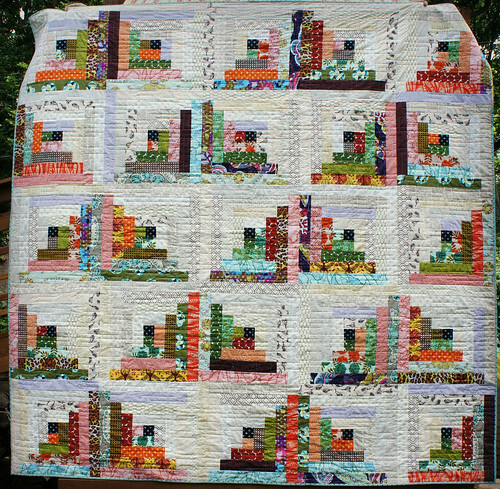 With blocks at 18″ square, this quilt finished at about 85″ x 85″. That was big enough to for to consider sending it to be long arm quilted (a treat for me) and I’m so glad I did. I think that my love for this quilt is still really strong because I didn’t wrestle with it for days during quilting. I sent it to Melissa at Sewshabbyquilting.com. Melissa quilted this for me very promptly and reasonably priced (she has a sale going on right for September too!) so I felt okay about treating myself for this. She did an all over interlocking square design that I could never do on my machine on a quilt this size. Love it! And though it pains me ever so slightly to let go of this quilt, I do have a plan for it. A lovely couple I know just got married and I think that this will be the perfect wedding gift. They don’t expect it and that’s part of the fun. This quilt is sort of about families and love (forgive the cheesiness) with a family of fabric designers and lot of love into making this. So I think it should go live with a new couple at the start of their new life together. What do you think? Do you want to make a Quiet Cabin Quilt of your own? it turned out just beautiful. i love the saturated colors standing out from the warm low volume prints. gorgeous! I'm smitten! It's wonderful to see the consistent center and all of the lovely fabrics that surround it. 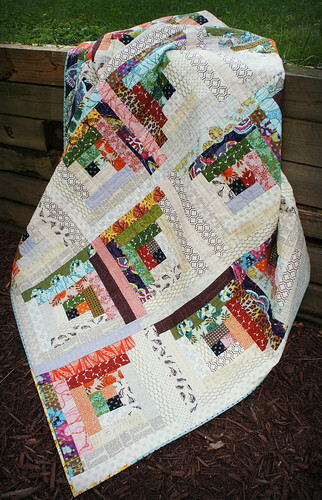 I LOVE how this turned and the quilting looks so great! Such a generous and amazing gift, too!! You rock!! Yes, I DO want to make one of my own! So gorgeous!! log cabins are my all time favorite too angela. i love the way you did the pyramid layout…ive not done that. yet. hooray for a fabulous wedding gift! I'm in love with it too. Just gorgeous. Here's what I think: I LOVE IT! I mean love it, love it. Love it. To me this really looks like an heirloom quilt, one that will transcend trends and generations. I have given away everything I've ever made except a tiny mini quilt, so I say give that thing away and let it be in your heart and theirs. Excellent. Breathtakingly beautiful, Angela! 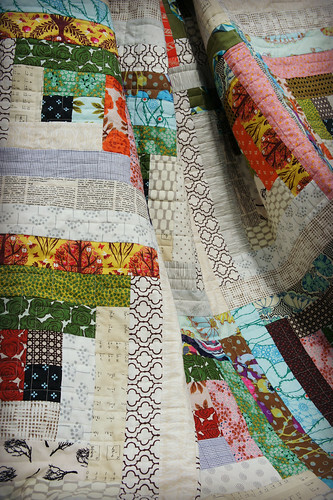 I truly enjoyed reading the story of this gorgeous quilt. Gifting it as a wedding present…. Priceless! Thanks sew much for sharing this. I'm a sucker for a log cabin. This is gorgeous, Angela. No wonder you love it so much. THe lights and darks? Beautiful. I keep coming back and coming back to this. I love the saturated colors of the brights and the understated colors of the neutrals. I'm going to have to try this. It's really compelling. I love the log cabin pattern, too. That is a great binding, too. oh thank you for noticing! I didn't mention it, but I adore the binding as well. I used a DS print from Joanns for most of the binding and then I ran out (err…decided to go scrappy?) and used another DS print in yellow for one corner. The icy blue makes me very happy. Gorgeously simple! LOVE IT!!! Thanks for sharing! The quilting is lovely too! Thank you! It's been such a fun and different quilt for me to make with all of these warm neutrals and saturated prints. I love this quilt and love the low volume? I'd love to make one. It's beautiful!! Well, I have never commented on a blog before but I cannot let the opportunity go here. This quilt is OUTSTANDING! The log cabin quilt pattern is not my favorite. But here, how you've placed the blocks, they almost look like books…and I do love books! Well done Angela! What did you choose for the back? Oh goodness! Well I'm so glad you decided to comment! I've had a couple people mention that they look like books in this orientation. I love how everyone sees something different in this quilt. The back is a combination of scrappy dark/cream neutral fabrics. I couldn't get a great picture of it, but it's interesting without fighting the front. Bravo! Such a lovely quilt! A perfect wedding gift! It looks so soft and cuddly! I do want to make one of my own. I think it is the unexpected colours, you did such a beautiful job of putting them together. 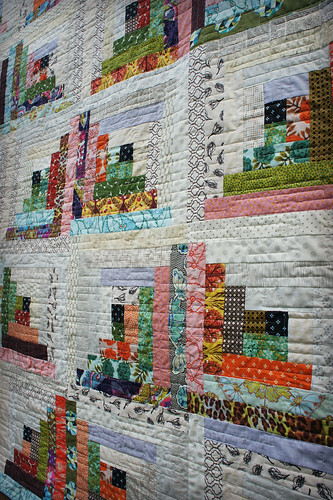 I love it, it is exceptional, yet just a log cabin quilt. Gorgeous! I'd love to make one! That is beautiful! I love the variety of colours, what a lucky couple! What a wonderful gift! 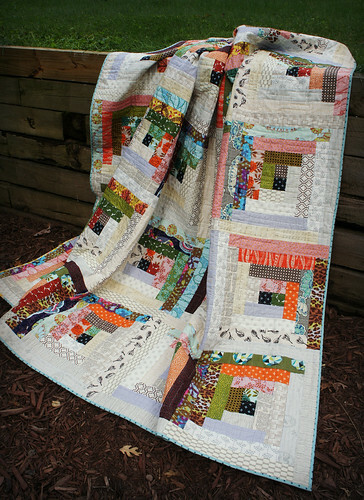 I don't think you can go wrong with a log cabin, I just love them, and the fabrics you chose work so well together. Oh I love this quilt! So classic yet very clean and striking. Can't go wrong with a log cabin! Gorgeous! I've made one log cabin, and gave it away in a Yankee Swap – ouch! It still hurts, but my sister and BIL have it on their couch and I get twinges every time I see it. But they love it and enjoy it and that makes it all worth it. I want to make another now that I've seen yours! So much prettier than mine, which was on the dark side. Yours is wonderfully warm and happy and just wonderful! Oh, Angela, this is simply wonderful! I would love to make a quiet log cabin. So sweet that you are passing it on. I'm sure it will be VERY well loved. P.S. My design wall rocks! I'm about ready to try the spray basting-on-the-design-wall experiment. I'll keep you posted. What a gorgeous quilt! It evokes a feeling of warmth — perfect for fall! Really love your quilt and the story behind it. I have made dozens of traditional log cabins, but I think maybe I'll try something a little less traditional next time. Thanks for sharing the story of your quilt. Beautiful quilt! 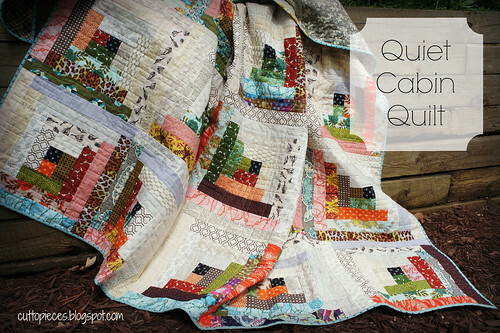 I love it and yes, I really, really want to make a log cabin quilt now! Five minutes ago I ordered a log cabin ruler from Nancy's Notions. Ironically, I then saw your blog. What a beautiful beautiful quilt. I think this ruler will only allow me to make 1" or 2" wide strips. Do you think that is going to be a problem? I realize my blocks will be smaller, but I was more concerned that the strips might look funny that skinny. I hate to waste the ruler, I suppose I could return if it won't look right. Thanks for your advice. Hmm..I'd have to look up the ruler to understand why it would only allow for those width strips. But I know that log cabins look stunning at any width really. You are still keeping the strip/square proportion so I don't think that there is any risk of it looking funny. With more blocks, you will want to consider your layout well to be sure the pattern doesn't look too busy. But this particular layout is fairly balanced and I think this would be a fine choice. I certainly like it! Looks beautiful and reminds me of bookends! Thanks for sharing the story of the quilt. How brave you were to embrace fabrics you were not sure about, and trust your instinct. The result is wonderful. Love it! This quilt turned out simply beautifully…so very interesting with the dark and light contrast and setting…perfect in every way. Lovely. Your quilt and Megan's have inspired me to make one. I've never made a log cabin quilt before, even though I've got quite a few under my belt. Perfect for fall! I can absolutely see why you love this one, Angela. It did turn out beautifully, beautifully! How nice that you know where it belongs too. I am absolutely in love with this! What great choices and what a beautiful finish! Such a special gift! Although the pattern is not one my heart is drawn to immediately I like your version of this log cabin pattern a lot. I like how you arranged the blocks and how you combined fabric. Well done! I really love this quilt. Well done.